The product is first rate but the best part of the transaction is the service I received from POR. Their phone rep was courteous, knowlegable and extremely helpful The experience was made even better by the fact that the wheels and tires were at my door within 2 business days of purchase! I am a POR customer for life after 1 purchase. These are great wheels. 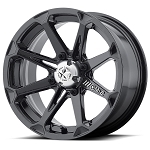 We've ordered these wheels several times for different 4wheelers! Fast shipping and great customer service! 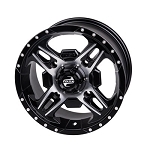 Q: I ordered this rim and it says it will fit all Polaris atv's except the (XP) and (scrambler) and I have a 2002 Polaris sportsman 400 and they won't fit the front because of the front Hub . What's your opinion on this?? A: The rim fits your machine but the center cap won't fit because of the extended hubs that come on the older Sportsmans. Unfortunately there is not a solution for this. Nobody offers a deeper center cap that we are aware of. If you decide to keep them you would have to leave the center caps off the front wheels. This will be the case with any of the early 2000's Polaris models. 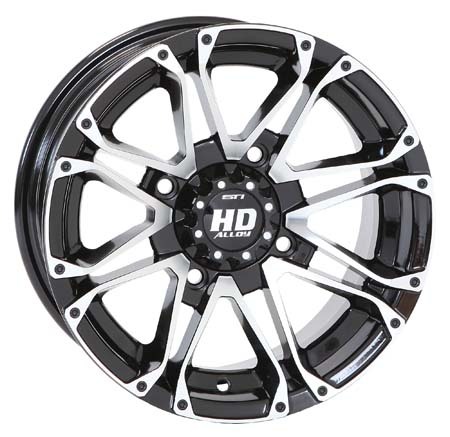 Q: Will the rim STIHD312M-12HD303-12HD303 fit on a 26-9-12 and 26-11-12 tires? If so what sizes. They are going on a 2011 Sportsman 500 HO. A: Yes those tires will fit the rims you are looking at. You just need 12x7 rims for those tires.